Κorres is a Greek company founded in 1996 in Athens by pharmacist Georgios Korres from the island of Naxos. It produces beauty products for women and men, based on natural ingredients (and partly on homeopathy) and it was a pioneer in Greece in this sector. Korres has a wide range of Korres Wild Rose Oil products to choose from. I love face oils but I have oily skin………hello oil slick by the end of the day kind of oily skin. So why would I be putting oil on my face then? I honestly find that the Korres wild rose oil helps to rebalance my skin. I’m not as oily as I used to be and my makeup isn’t sliding off my face by the end of the day like a landslide. I put a few drops on my face, after removing my makeup and in the morning as well if I want that dewy look. This absorbs super quick and it is not oily at all. My skin feels super soft and smooth. Did I mention the smell?? It smells yummy, I would wear this as a nice light perfume! 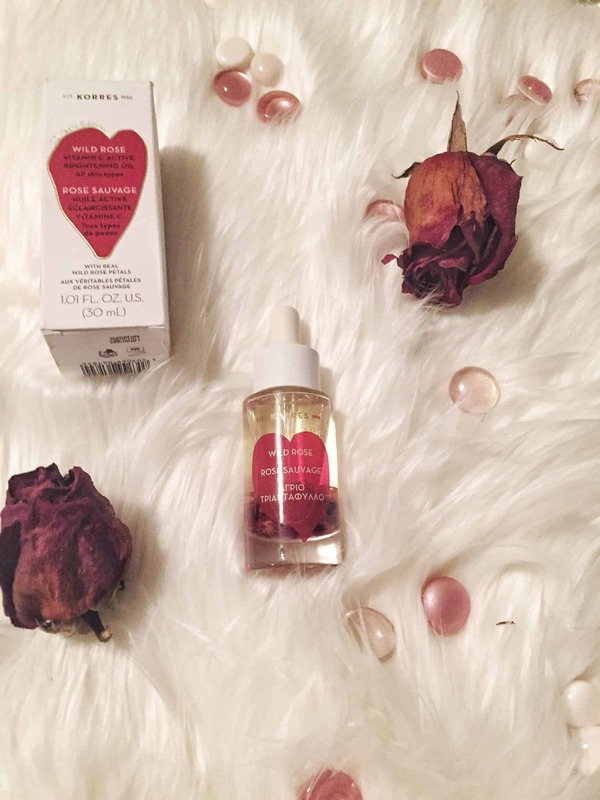 This is a brightening oil that is infused with real rose petals (they are actually in the jar), Korres wild rose oil is boosted with Super Vitamin C, 1000% more stable than pure ascorbic acid, that will give you glowing, radiant skin. This oil is rich in omega 3, 6, and 9 fatty acids and vitamins A and C. This helps to repair fine lines (hello, I will take all the help I can get!) and wrinkles while improving skin’s overall tone and texture – I’m talking super soft, smooth texture. Check here for the most up to date prices. 3. The formula is boosted with Super C which increases skin’s vitamin C absorption by 1000% to promote collagen synthesis, powerful skin brightening, tone repair, and antioxidant protection against free radical and UV damage. The Korres Wild Rose Oil can be applied both morning and evening. Simply apply a few drops to your face and neck, gently pressing into the skin. Followed by the Wild Rose Face & Eye Serum and pressing the Korres Wild Rose Oil on top to seal in moisture and boost radiance. Or mix a few drops into Wild Rose 24 Hour Moisturizer for lasting hydration and a dewy glow. Isoamyl Laurate, Caprylic/Capric Triglyceride, , Prunus Armeniaca (Apricot) Kernel Oil, Squalane, Helianthus Annuus (Sunflower) Seed Oil, Ascorbyl Tetraisopalmitate, Dimethyl Isosorbide, Rosa Canina Fruit Oil, Rosa Gallica Flower Powder, Alcohol Denat., Alpha-isomethyl Ionone, Aqua/water/Eau, Benzyl Alcohol, Benzyl Benzoate, Benzyl Salicylate, Bisabolol, Butylphenyl Methylpropional, Citronellol, Eugenol. I have tried so many face oils and this is the only one that I find absorbs instantly without the greasy feel to it. It makes my skin dewy and appears plumper. If I use this under my primer, I find that my foundation goes on smoother. Check here for some other Korres Wild Rose Oil products and prices. Have you tried any facial oils? Any recommendations? I love facial oils too. I have combo skin and oils are great for it. Some stand-outs are the NuWorld Botanical Cold-Pressed Seabuckthorn one, the Saje Elixir, and an old favourite is the Clarins Lotus oil. I haven’t tried this brand before, but it sounds (and looks) beautiful. I haven’t used an oil during the day, only before bed. I love this oil. It does look stunning with the roses in it, and it smells pretty too.